In October 2013, Jason Day - Simple Minds' A&R contact at Virgin - asked me whether I'd compiled a track listing for a deluxe edition of Sparkle In The Rain. With Simple Minds now attracting rave reviews and Big Music in the pipeline and scheduled for a 2014 release, he felt the time was right to start reissuing albums. 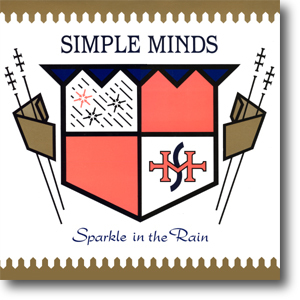 Sparkle In The Rain was chosen first as it was intended to mark the album's 30th annivesary. I prepared track listings for a Deluxe and Super Deluxe editions the album. I suggested that the Deluxe edition should feature "everything that was released" whilst the Super Deluxe should feature "everything that can be released." Jason unexpectedly resigned from Universal Records in March 2014. The project started to slip. Even though there was no current representation at Universal, I started compiling a thorough history of the album by combing through old biographies, press cuttings, fan club magazines and old music publications. This resulted in a weighty Word Document which included all the proposed track listings, tape research notes, quotes, timeline and key events. Steve Hammonds stepped into Jason's vacated position in May 2014. He proposed a much larger release - including Super Deluxe - and his proposed track listing tallied with mine. The project started again with a potential release date of October/November 2014 on eight formats (some physical and some digital). Tape research started in June 2014 at Abbey Road. The Barrowland gig from 28th February 1984 was selected as it was representative of an early Tour Du Monde concert. The entire concert was lifted straight from the master tapes - the only post-production was to tidy up the introduction music (the studio version of Shake Off The Ghosts which was piped through the PA) and to shorten the gap between the main-set and the encore. CD layout was completed by July 2014. Steve Wilson remixed the album from the original multi-track tapes to first produce a high resolution stereo mix and then the various 5:1 surround sound remixes. These were only available on the DVD and Bluray editions. The artwork for the five formats was created by Curt Evans of 37-design. The artwork for the LP was as close to the original as possible, but other formats expanded upon the graphic design of the original album and singles by Malcolm Garrett. 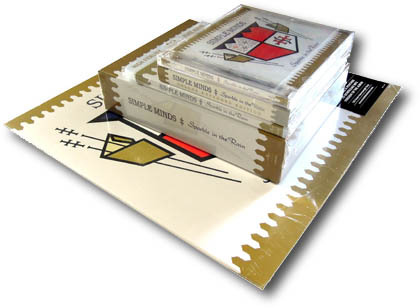 The layout and graphical style of the original Sparkle In The Rain Music Book was used as a template for the Super Deluxe booklet. I wrote the sleeve notes in October 2014, drawing from original publications and music journals, and new interviews with Jim and Charlie conducted by Paul Sinclair of www.superdeluxeedition.com. The release of Big Music in November 2014 pushed the release of this set back to March 2015. The project was formally announced on the 8th December with press release and 3D pack-shot of the Super Deluxe version. The album was newly mastered from the original ½" master tapes by Andrew Walters at Abbey Road Studios. The 2002 remasters by Simon Heyworth were used as guides for the album itself. All the tracks were remastered from these original tapes including the album, the B-sides and extended mixes, and the Barrowland live concert. In the lead up to its release, Sparkle In The Rain was Album Of The Day on Friday 20th March on BBC Radio Six Music. As part of the ongoing promotion, Jim appeared on Zoe Ball's Sound Of the 80s on March 14th, Steve Lamacq's Roundtable review show on the 26th March, and Jools Holland's BBC Radio Two show on March 30th. It reached #80 in the UK chart. A limited edition picture disc of Waterfront was issued on Record Store Day 2015 to tie-in with this release. The first pressing of the Blu-Ray had the same two problems. Again, those who'd already purchased the Blu-Ray could receive a replacement disc after contacting Universal; retailers were sent replacement discs who then replaced them in their stock.